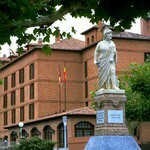 This red brick construction harmoniously contrasts with the fresh water of the river Ebro and the Cidacos Valley. The dense vegetation of the garden, filled with flowers and palm trees, is inserted in one of the most important historical and artistic ensembles of La Rioja. 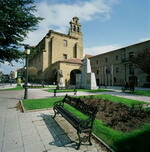 The most representative building of the former Calagurris, of Roman origin, is the Cathedral. Wide portals, large windows and blinds adorn a structure with smooth lines which, inside, has a decoration with a clear Medieval influence. The working rooms are characterized by their spaciousness and modern and functional installations. 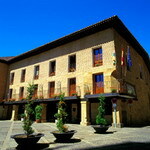 The Parador occupies a 12th c. former hospital, next to the cathedral, built by Saint Dominic to give shelter to the pilgrims on the Road to Santiago. In a regal and elegant style, it has majestic living rooms and a lobby with Gothic arches and wooden coffered ceilings. Noble materials and bright colours - blues and whites - lead to comfortable bedrooms, decorated with exquisite taste; some have four poster beds. A warm, harmonious and balanced environment, also suitable for social functions and meetings. Under the modern cupola which covers the novices patio, we may find the "Recreo" Restaurant, whose name refers to the break the monks used to take in that same patio. This new gastronomical offer is based on La Rioja's wonderful products, which are prepared in a simple way. The décor and the waiters' outfits are in unison with the restaurant's modern features and the wine list offers the most innovative products of the region's cellars. The Parador is sited in the Convent of San Francisco, 800 meters from the historic center of Santo Domingo de la Calzada. Its location on the "Way of Saint James" pilgrimage route, its design, and its unmistakable cultural value make it the ideal place for rural tourism, nature walks, or to enjoy a northern winter at its best.